Pattaya’s garbage crisis expanded to yet another neighborhood last month with residents of Naklua’s Rongmaikeed Community complaining that the city has left 800 tons of refuse there to rot. 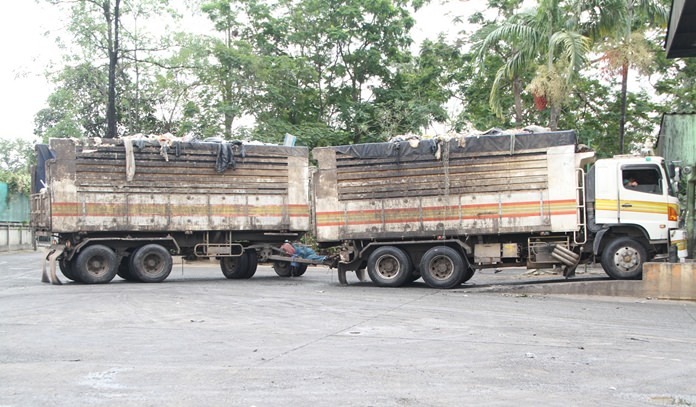 Neighborhood President Boonma Fungrak said Jan. 31 that since last year Pattaya had contracted with a local rubbish-collection firm to temporarily park waste there before it was hauled away to a landfill for permanent disposal. However, since the end of October, trash transfers have slowed and now the amount of garbage coming in is outpacing the lot’s capacity. Boonma said the facility can take 300 tons of garbage a day, but now 450 tons are coming in. That has resulted in a backlog that topped more than 1,000 tons in December and now sits at 800 tons. Neighbors have had enough of the rotting smell and foul liquid runoff. Rongmaikeed is just the latest chapter in Pattaya’s worsening solid waste saga. The city is generating so much garbage on a daily basis that city hall is unable to dispose of it all. Residents close to a trash dump on Sukhumvit Soi 3 previously protested and shut down the facility. As much as 50,000 tons of refuse have piled up on Koh Larn. And now Khao Maikaew residents have renewed their protests after 120 tons of hazardous medical waste was dumped in their backyards. Meanwhile, the Pattaya City Council has done little to resolve the situation, increasingly relying on a landfill in Laem Chabang while shuffling garbage around city neighborhoods until it can either be removed or residents rise up.